Transferred from Graduate Hospital by William B. Kent, April 1962 (Accession No. : 62-13). The Howard Hosptial Records are arranged alphabetically by folder title. When possible the original folder titles were maintained. New folder titles were applied when originals did not exist, or to provide better organization to the collection. 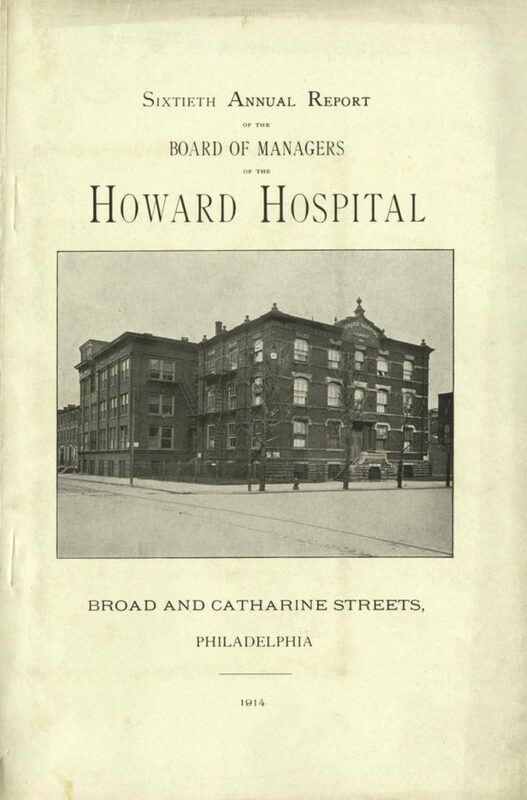 Howard Hospital was organized in 1853 as a charity hospital to provide medical care for factory workers who lived in the western part of Philadelphia. Initially called the Western Clinical Infirmary and Hospital for Incurables, the hospital was located in two rooms over a store at the northwest corner of Seventeenth and Pine before moving to its next home in a house at the corner of 15th and Christian Streets. Based on the structure of the Vienna Hospital, where physicians would be appointed as specialist in specific medical fields, doctors were appointed to handle diseases of digestive organs, diseases of the chest, diseases of females, diseases of brain and nervous system, fevers, diseases of urinary organs, diseases of eye and ear, and surgery. In 1859 the Board of Managers petitioned to change the name to the Howard Hospital and Infirmary for Incurables, after English philanthropist John Howard (1726-1790) who was noted for his reform efforts in hospital management and prison discipline – though no reason for the choice is given. A year later the Hospital took up new residence when it rented space at 1812 Locust Street. Then in 1861 the Hospital purchased the old Welsh Church at 1518 and 1520 Lombard Streets for $5,000, where it was located for the next quarter century. The start of the Civil War financially affected the Hospital as donations decreased, while requests for services increased. In addition many of the original doctors resigned or went off to military service. Howard Hospital’s Board of Managers formed a committee to locate a site suitable to construct a new hospital building in the spring of 1886. That fall the lot on the southeast corner of Broad and Catharine Streets was purchased for $24,000. Construction of the building was finished in 1889, and an annex was completed in 1894. From this site, Howard Hospital continued to provide charity medical assistance to the community. The Hospital had long been associated with medical education by providing students from the University of Pennsylvania’s Medical School with clinical instruction. On its own the Hospital provided a training course for nurses, and instruction on anesthesia. In 1929 the Board of Managers agreed to merger with the Trustees of the University of Pennsylvania. Under that agreement Howard Hospital was to become part of Graduate Hospital, where a specific space would be named after it. It was determined the building would be made available as a nurses’ home in connection with Graduate Hospital or other way deemed necessary. The medical and nursing staff from Howard Hospital was to be amalgamated with that of Graduate in accordance with its requirements. The Howard Hospital Records document the administrative activities of the Hospital during the early Twentieth Century. The bulk of the collection relates to the financial dealings of the hospital – namely upkeep of the facilities, and contracting for services. Correspondence between professional organizations and government agencies is also included. The clinical reports primarily contain statistical information used in the annual reports. The Patient Admission Record Book contains detailed information for individuals admitted to the Hospital during that period. There is a near complete run of the published Annual Reports from the Board of Managers from 1860 through 1927. Aside from the Annual Reports and other published pamphlets, the collection does not contain any documentation of the Hosptials in the Nineteenth Century. Howard Hospital and Infirmary for Incurables. Western Clinical Infirmary and Hospital for Incurables (Philadelphia, Pa). Companies Patronized by the Howard Hospital n.d. Course in Anesthetics – blank diploma n.d.
Employer’s Report of Accident to Employe form – blank n.d.
Graduate Nurses’ Association of Pennsylvania – Question are n.d. List of Patients and Procedures n.d. Maid and Orderly assignments n.d.
Reports 1860-1927 Inventory Note n.d.
Rules Governing the Giving of Information Concerning Patients of a Hospital n.d. Surgeon General of the United States Army – Information Blank n.d.
Treasury Department – Question are n.d.